Chinese Food during New Year | Memorable Days : Beauty Blog - Korean Beauty, European, American Product Reviews. By the end of the year my mom is making some Chinese food to give to friends and family. People in Hong Kong/China will eat this during Chinese New Year (in February). Do you eat this as well? Or do you recognize it? The Chinese turnip cake/radish cake. You can order this when you´re going to eat dimsum, Chinese people call it yumcha 飲茶. It´s one of my favorite food :). 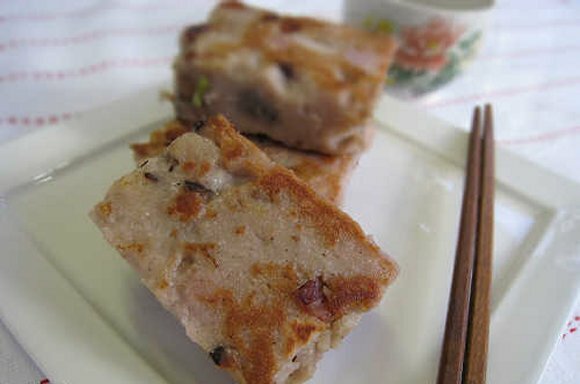 This is made from mashed daikon radish mixed with dried shrimp and pork sausage that are steamed and then cut into slices and pan-fried. This is a New Year sticky cake. 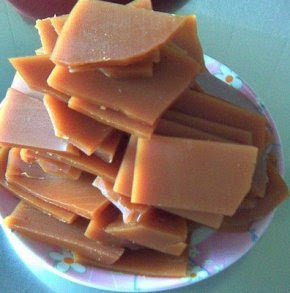 Nian Gao is made from glutinous rice flour, sugar and water. It can be eaten many different ways. Some people like it warm, soft and sticky and some like to pan fry it with eggs. It´s not my favorite food, but I usually eat this when it´s warm and sticky. 糕 Gou, in Cantonese pronounces the same as the word 高 height. By eating these Chinese cakes, children are blessed to grow faster and taller (年高). When adults eat these cakes, their business sales will grow more and more every day and hopefully they will also get a job promotion (年年高升). That’s why it´s important to eat these Chinese cakes during New Year. What do you eat during New Year? I'm celebrating with my family at my grandma's house on the chinese new year. i think we're going vietnamese food. awwww i must try the first one! @Jennifer, yess, lei xi is one of the good parts of new yearr lol xD. I LOVE 年糕!! I wished they sell that stuff in Japan :( Happy New Year Elisa! !